This is part two of a tutorial series covering the usage of Core Data in Swift to write iOS apps with persistence. If you haven’t read part one yet, read that first. First off, if we’re going to do anything more interesting than just showing a single record pop up in an alert, we’ll need to generate some more records to play with. Let’s open up our LogItem.swift file and add a helper function for adding new records. Basically, we want to be able to simply call a method on the LogItem class, pass in some parameters, and get a new LogItem back. The LogItem class is not tied to any specific NSManagedObjectContext, so we want to make sure we aren’t storing the reference to the managed object context anywhere in the model, it needs to be passed in when we want to create an object like this. The first line is the function definition. It’s a class function called createInManagedObjectContext, which takes an object of type NSManagedObjectContext as the argument moc, a String called title, and a String called text. The function returns a LogItem object that’s been inserted in to the specified managed object context. Then it executes nearly identical code as before to create a new LogItem object, except now it’s using the arguments passed in to the function to set up the new LogItem object. To keep the code simple, we’re using some shortcuts in order to seed our data. What you’re seeing when I’m setting items is an array (using square brackets ), then each element is a tuple of two String values, [(String, String)]. Next, I’m decomposing them back in to two variables, itemTitle and itemText for each of the tuples in the array. Finally, I call the createInManagedObjectContext method, which we created earlier, passing in the new itemTitle and itemText. If you already know how to set up a UITableView programmatically and want to skip ahead to the Core Data stuff, click here. Now that we have a couple of records, let’s remove presentItemInfo and instead opt for a table view here. 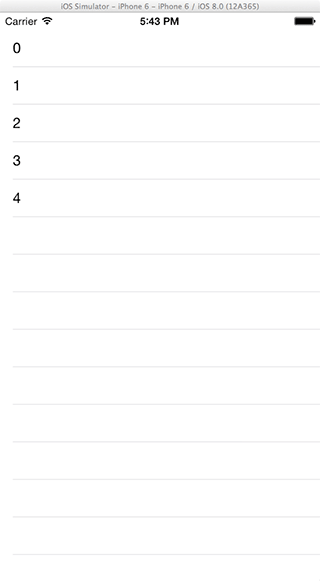 We’ll add this all right under viewDidLoad and programmatically create the UITableView. In my iTunes tutorial we do this using storyboards. If you are more interested in working with storyboards I recommend taking a pit stop there to read about how to get that set up. // Here, we tell the table view that we intend to use a cell we're going to call "LogCell"
Still with me? Hope so… if not here’s the full ViewController.swift code up until this point. Note that we also removed the viewDidAppear function since we were only using that for testing out some things earlier. This will give us a numbered list of rows if we run the app. This just confirms the table view is set up correctly. This means that the model Core Data thinks it’s working with doesn’t quite match what’s been stored in the database. Resolving this with a live app means migrating between versions of your model. But for the purpose of learning and doing the initial development, usually the quickest way to just keep moving is to delete the app from the simulator; wiping out the data, and therefore resolving the conflict. Now that we have this all set up and ready to go, we can start working on getting our log data showing up in the table view. Please note that at this point in the tutorial, I’m intentionally avoiding the NSFetchedResultsController class. I’m doing this because I believe it will make more sense from the Core Data perspective the first time around if you see it done the old fashioned way. After this tutorial is over, I encourage you to look over the class and see how you might use it to implement some of these things instead. I think it is important to first learn how to implement a core data backed table view without using the helper class. The helper class is not applicable in all situations, and learning it first would be doing yourself a disservice. You’ll find it doesn’t work for all use cases (not even close), and in it’s magic it hides some of what’s going on. First off, let’s fetch all the results from Core Data in viewDidLoad(), and store them in an array of LogItem’s, logItems. Next, we’ll populate it from viewDidLoad(), inside of a function called fetchLog(). Now we can modify the tableView dataSource methods to refer to this array instead of hard-coding values. // How many rows are there in this section? 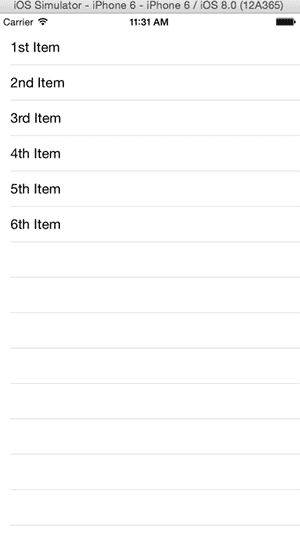 This should set us up to see the items listed in the table view, but we want to show the text of an item when it’s clicked. So we need to set the table view to use this view controller as it’s delegate, so we can receive the callback method, didSelectRowAtIndexPath. This will set us up so that when the button is clicked, a message will show in the console (in the Xcode window) showing the itemText for the clicked item. The purpose of this tutorial is not really to explain how to set up a table view manually, but it’s sort of necessary in order to get a good look at the data. For this reason, I’m providing the source code up until this point in the tutorial here. Feel free to simply check this out and work from this code base, from here we’ll be talking more about the Core Data side of things. Your ordering may be different every time you run your app, this is because it contains no sorting when it performs the fetch request. In some data stores you might get this data back in the same order as it was inserted, but with Core Data it ends up being fairly random. Let’s change this by adding a sort to the fetch request. Now the fetch request has it’s sortDescriptors property set. Note that this is an array, which is why we need the brackets around the single sortDescriptor we created using the title key. 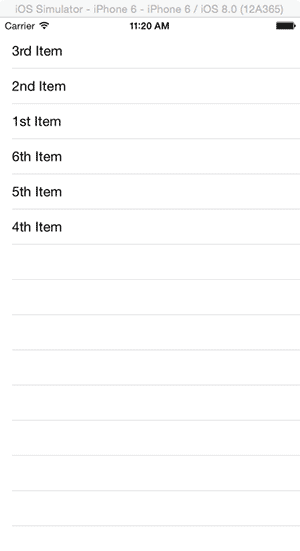 Running the app you should now see the sorted (alphabetically) list of items, much better. Note your data is expected to be different. Let’s also look at filtering out certain elements. First, let’s just try and only get the item named “Best Language”. We’ll create an NSPredicate that uses a string to represent the requirement that any object must fulfill in order to pass through the query. // doesn't have a title of "Best Language" exactly. If you haven’t seen the format syntax yet, or haven’t seen it in a while, it’s simple enough to say that any time you see format as a named parameter, it comes from the Objective-C methods “predicateWithFormat”, or “stringWithFormat”, and so on. This replaces any instances of the %@ symbol with an object’s description (the value of a string, or an otherwise useful representation of other types of objects). For primitive types such as an Int, you’ll want to instead opt for %i, %f for Float, and so on. So we’re just specifying we want title to equal that exact string. Running the app now we should see just one item. // Search for only items using the substring "Worst"
What if we wanted to combine the two though? We want both items containing the string “Worst” and any one with a title “Best Language”? What we did here is quite powerful in practice. We can use string comparison as predicates, and filter/order large lists of data through Core Data. The Core Data API will then connect to the backing store (SQLite) and produce an efficient query to quickly retrieve the needed information. This is a very common pattern in iOS development, and understanding it is very important. So, if you got stuck on this tutorial or have any questions, don’t hesitate to ask for help on the forums. This concludes Part 2 for now, in the next section we’ll move in to a more applicable scenario by adding a way for user’s to create log items, edit, save, and delete them. If you’re reading this scratching your head, or just want a deeper dive in to Core Data, be sure to look at my Swift book, which is now available for early access. And don’t forget to subscribe to get updates on this tutorial series via e-mail. Don’t have 6.3 yet? Make sure to download it here using your iOS Developer account. Core Data is the de facto standard way to persist and manage data in both iPhone and Mac applications, and with Swift it’s a bit easier. So it’s only natural that we should take some time to learn about it when building apps. Eager to see what we’ll have created by the end of this tutorial? Take a look at the video, we’ll be creating this table view, populating it with data, adding the ability to delete records, add records, and sort/search records all backed by Core Data. This data is persistent and lasts even through a complete shut down of your phone. The first thing to know about Core Data before diving in is that it is not a relational database, and although it uses SQLite as a backing engine, is not an ORM to a relational database either. The SQLite backend is more of an implementation detail, and in fact binary files or plists can be used instead. Before we get too technical about what Core Data is, I think it’s useful to dive in and start playing with the API a bit. 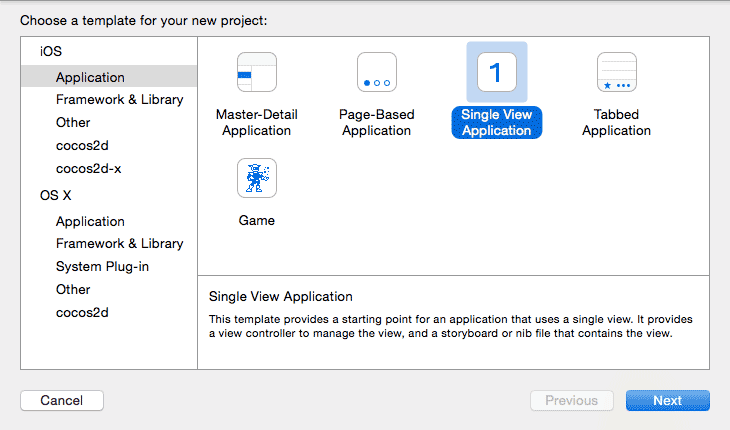 Create a new Xcode 6 project using a single-view template, Swift as the language, and with Core Data enabled. I’ll call the project MyLog. Looking at the AppDelegate.swift file you’ll notice using this option has added quite a few functions. Most of these are setting up the Core Data stack. The defaults are fine for now. The primary object that needs to be used to work with Core Data is the managedObjectContext defined here. If you used the Core Data template as shown above, this code will already be present. // conditions that could cause the creation of the context to fail. We’ll be accessing the managedObjectContext pretty frequently, so we should pull this out of the viewDidLoad() method and move it somewhere we can access it easily. How about if we just store it as an instance variable on the ViewController? You’ll notice the Xcode template produced an additional file, MyLog.xcdatamodeld. Opening up this file you can see the Core Data model editor. Let’s add a new Core Data entity called LogItem. Our log app will show a list of LogItems, which have a bit of text in them. Click the “Add Entity” button and then in the right-hand panel select the “Data Model Inspector”. From here we can rename the default name, Entity, to LogItem. Next, at the bottom we can add our first attribute by pressing the “+ Atrribute” button at the bottom. Name this attribute title, and give it a type of String. We’ll also add a second attribute of type String called itemText. 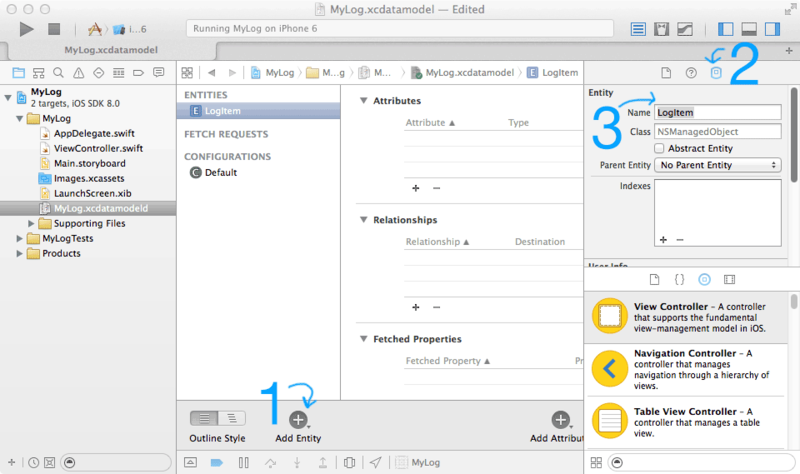 From this point on, any changes you make to your Core Data model, such as adding a new Entity or Attribute will lead to an inconsistency in the model of the app in the iPhone Simulator. If this happens to you, you’ll get a really scary looking crash in your app as soon as it starts. You’ll also see something like this show up at the very bottom of your console, “reason=The model used to open the store is incompatible with the one used to create the store”. In the iPhone Simulator, or on your device, just delete the app, and then perform a new Build & Run command in Xcode. This will erase all out of date versions of the model, and allow you to do a fresh run. In the first prompt, check the MyLog model and press next. Then, check the LogItem entity, and press next again. This class is generated from the xcdatamodeld file. The entity we created is represented by the similarly named class LogItem, and the attributes are turned in to variables using the @NSManaged identifier, which gives the variables special treatment allowing them to operate with Core Data. For most intents and purposes though, you can just think of these as instance variables. Because of the way Swift modules work, we need to make one modification to the core data model. In the field “Class” under the data model inspector for our entity, LogItem, we need to specify the project name as a prefix to the class name. 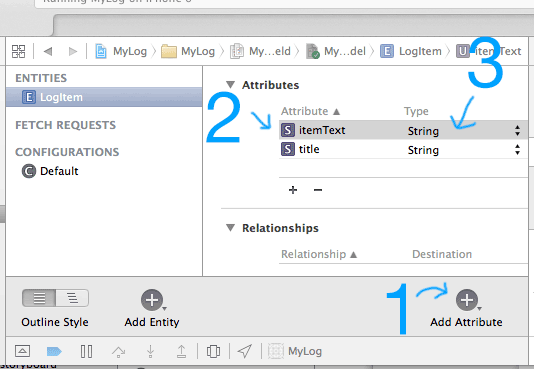 So instead of just specifying “LogItem” as the class, it needs to say “MyLog.LogItem”, assuming your app is called “MyLog”. In our ViewController.swift file in the viewDidLoad method, let’s instantiate some instances of LogItem. There are many ways to do this, but the least verbose is to use the insertNewObjectForEntityForName method of NSEntityDescription. Here we insert a new object in to the core data stack through the managedObjectContext that the template function added to AppDelegate for us. This method returns an NSManagedObject which is a generic type of Core Data object that responds to methods like valueForKey. If you don’t quite understand what that means, don’t worry too much about it, it’s not going to prevent you from being able to use Core Data. Let’s keep moving. With an NSManagedObject version of newItem, we could say newItem.valueForKey(“title”) to get the title. But this is not the best approach because it leaves too much opportunity to mis-type an attribute name, or get the wrong object type unexpectedly and have hard crashes trying to access these attributes. So, in our case, we instead cast the NSManagedObject that insertNewObjectForEntityForName returns, to our generated class LogItem. newItem.title = "Wrote Core Data Tutorial"
newItem.itemText = "Wrote and post a tutorial on the basics of Core Data to blog." If we had not generated our LogItem.swift file earlier, the type LogItem would not be defined and we would be limited to working only with NSManagedObject types. This is a really nasty way to work with the Core Data API as it relies heavily on determining object classes, entities, state, and more at runtime based on string comparisons, yuck! Now that we’ve created a new item, and set both it’s title and text, we can query it elsewhere in our app and get the object back. Let’s override the viewDidAppear() method and implement a way to look at our items info. We’ll perform a Core Data fetch (which is like a query if you have worked with SQL before), then we will present the contents of the row we retrieved in a new alert window. First, we create a new NSFetchRequest instance using the entity LogItem. Next, we create a fetchResults variable by using the executeFetchRequest method of managedObjectContext. The only thing we have specified in our fetchRequest is the entity, so this particular fetch just returns every record. If you are familiar with SQL, a fetch request with no predicate on the LogItem entity is something like “SELECT * FROM LogItem”. Next we create a UIAlertController instance to present a message to the screen, and set it’s title and message properties to the title and itemText properties of the first LogItem in our fetch results (which is an array of LogItem objects). Run the app and you should see the item presented to the screen. You’ve now stored and retrieved data from Core Data. This is the first step in to building apps with persistent storage. In part 2, we’ll talk about working with multiple records and using NSPredicate to perform filtered requests. The full source code to this part is available here on Github. If you found this post useful, check out my other tutorials, and take a look at my Swift eBook, which is now available for early access. First off we’ll create a new Xcode Project using Swift as the language, and using the Single View template. Now, in the ViewController.swift file we can start adding in our custom code inside of viewDidLoad(). First we create a AVCaptureSession object to work with. Let’s do this as a class variable. Now, in viewDidLoad let’s set our quality settings and find a device to record from. First, let’s take a look at the list of devices available. This is from my iPhone 5S. Looks like we have two microphones, and the front and back cameras. Cool. For our purposes let’s try and grab the back camera. If you run the app on a device now, you should see a preview of the camera. This is pretty much just the standard iOS camera. Let’s now modify the focus mode. Add a new method called configureDevice() and have beginSession() call it on the first line starting the capture session. Add this method, it locks the device, sets the focus to locked, and then unlocks the device. Run the app now and try tapping to focus on different parts of the scene. The default focus behavior should now be disabled. This means we can control the focus on our own. Let’s add a UISlider to control the focus. First, we validate that the device exists, then we lock the device. If the lock is successful we call the setFocusModeLockedWithLensPosition() API to tell the lens to focus on the point ‘value’, which is passed in to the focusTo() method. This just gets a value from 0.0 to 1.0 based on how far you are touching on the screen horizontally. Run the app now and slide a finger left to right on the screen. You can now manually control focus this way! Cool right? Next time we’ll add an option for manually setting the ISO and exposure. But for now, this is a start. Make sure to subscribe to my newsletter to be notified of Part 2. Coming soon! Want a deeper look at the AVFoundation API? Pre-order my upcoming book on developing iOS 8 Apps in Swift. A few weeks ago I did a little thought experiment on how we might re-implement Swift’s optional type by using the Swift enum. If you haven’t read that yet, you can read it here. In this post, we’re going to push a little further and see if we can get something that corresponds a little more closely to the Swift Optional type. It’s fairly straightforward to use the class by using the generic constructor, passing in your value, and then using our overloaded >! operator to unwrap. var a = myOptionalString.unwrap() // "A String!" var c = myOptionalString>! // "A String!" Or even worse, you might get an error about Optional<String?> not conforming to MirrorDisposition, this is basically Swift being unable to find comparison operators between Optional and nil… so it’s falling back to what it can find: MirrorDisposition, which is something Swift uses for some of the nifty IDE features. The JOptional is nil, but it has a ‘Some’ case instead of ‘None’, because we used the init(_ T) method to instantiate it, and the init method sets the Some case even if value is nil. As a result, JOptional is in fact *not* equal to nil! We could modify this behavior by doing a check on that init method and setting None if the object is nil, but this introduces the issue of needing to update the case if the inner object is modified. This introduces a variety of issues, so what may be better is to simply implement two Swift interfaces that help solve this common problem: Equatable and NilLiteralConvertible. Equatable just specifies that we are going to implement our own operator for ==, specific to our type. NilLiteralConvertible gives an interface to convert between JOptionals and nil literals. In our case, a nil object with type JOptional should be converted to JOptional.None. It’s important to note, comparing two optional (even in Swift’s implementation) only compares that the case is the same (Some vs None) It does not compare the inner values, you need to unwrap for that behavior. If we get a nil lhs or rhs value in this == operator, we need Swift to know to convert that to the .None case. So we implement the init(nilLiteral: ()) method. This topic is explored more in-depth in my upcoming book. In the meantime, take a look at my other tutorials and posts about Swift. Re-implementing Optionals using Swift’s powerful enum type. If you’ve been messing with Swift much lately, you may have noticed that enum’s do much more than they did in Objective-C, or in most other languages for that matter. In the WWDC videos discussing Swift, one of the presenters mentions that Optionals are implemented as enums. Let’s explore this a bit and see if we could possibly implement Optionals ourselves, as an exercise in exploring Swift’s enum type. The first thing to note about an Apple’s implementation of Optional is that it’s an enum with two cases, Some and None. So first off, we create an enum, let’s call it JOptional, and add these cases. When we set the enum case to ‘Some’, we should also have an associated value, but it can be any object type. So we use the T keyword to specify it’s a generic type. We haven’t built out any fancy shortcuts that Swift’s regular optionals use yet, but we can still instantiate JOptionals directly if we add some init() methods. If it can, then it’s safe to assume that x actually contains something, and since this is an unwrapping, we can return it. Otherwise, this falls back to the default case, which is where we need to point out to the developer that they attempted to unwrap a JOptional that wasn’t able to be bound to x. I added an assert here, I believe this is also present in Apple’s Optional enum, since a force unwrapping of an Optional produces a hard crash. The value of a should now be to “A String!”, while myOptionalString should still be JOptional.Some(“A String!”), which will print as (Enum value). In Apple’s Optional, one can unwrap by just appending ! to the end of the variable. We can’t use this symbol since it’s reserved, but there’s no reason we can add >! as a new postfix operator. Why >! you ask? I have no idea, but it’s not taken. Actually, this is a pretty good example of how to not choose operator overloads, but that’s okay. No one is ever going to use this, I hope. This concludes part 1. In the next part we’ll implement nil comparison using the Equatable and NilLiteralConvertible interfaces. This topic is also explored more in-depth in my upcoming book. You should now have a web server up and running that accepts a POST call to /login. The server by default runs on port 4567, so now let’s create a Swift project to interact with it. A simple single-view project is fine for this example. // check and make sure that json has a value using optional binding. // Woa, okay the json object was nil, something went worng. Maybe the server isn't running? First we create a request and a session to operate on. Next, we set some params in a Swift dictionary, these values will be passed to the server. Using dataWithJSONObject() we can encode our parameters as NSData, and set the HTTPBody of the request to this NSData object. The last parameter of dataTaskWithRequest is a closure that contains values for the response, data, or error from our server. After deserializing the response with JSONObjectWithData(), we can check json[“success”] for the 0 or 1 coming back from our server to see if the request succeeded, and process the results. Most of this is just boilerplate, so it’s useless to move this all out in to a new function, we’ll call it post(). Move all the post logic out to this method, taking params and url as arguments. Now our main logic can be greatly simplified for making any POST request. Let’s make a couple in the didFinishLaunching method. In your console you should be able to see three login attempts, with only one of them succeeding. This is all great, but we should probably implement a way for the post request to notify our caller of a success or failure. Let’s add a Swift closure as a third method parameter to our post() function, so we can call it upon success or completion. Now we have our new postCompleted closure, we can pass back to the caller whether or not the post request “succeeded”, and a string message to display to the user. var msg = "No message"
We’ll also need to modify how we call the method in our applicationDidFinishLaunching function. Inside of this closure we create an UIAlertView control and populate it based on the succeeded and msg variables. Then, we move back to a foreground thread and show the alert view. alert.title = "Failed : ("
Give it a whirl, and can now see a server logging in a user (or failing to) with some UI feedback. Cool right? Try changing the login information and see what you get. This is an overly simplistic server but I just wanted to demonstrate how you would go about making a POST request in Swift. I hope it was helpful! The full source code to this project can be downloaded from Github here. In my book I go in to much more detail, showing how to work with form data and chain API requests together. It means your variable is set to nil, but your code is expecting it to not be nil. Let’s get this error to show up, and analyze what’s happening. Okay, confirmed. username is nil. print() understands this and just tells us as much. But, what if we want to make it uppercase using username.uppercaseString? First, let’s try it with a regular ol’ string. error: value of optional type ‘String?’ not unwrapped; did you mean to use ‘!’ or ‘?’? Oops, we can’t use uppercaseString because it’s not available in the Optional String? We need to get an “unwrapped” String variable in order to use uppercaseString, because otherwise what we’re seeing is an optional value. Think of this like a “box” we keep values inside of. The box may be empty, or it may contain the value we want. But to be sure, and to work with the internals, we need to force unwrap it by adding an exclamation mark to the end. Optional is actually an enum that contains some information on the variable that’s “inside” it. When it contains something, the case is ‘Some’, and when it’s empty it’s value is ‘None’. Or in other words.. the Swift compiler is asked to work with what’s inside the box, and if it’s empty, it’s case is “None”. Otherwise, it’s case is “Some” with an associated value, like a username. let username: String? = "jquave"
let password: String? = "romneycomeback"
If you’re interested in learning more about Swift, be sure to subscribe to my mailing list for updates. I also recently released a complete Swift 3 Fundamentals Tutorial that covers the language in greater detail. This table is slow! Let’s speed it up. This is the first time we’ve seen this syntax so let me explain real quick. The type specified here is [String : UIImage], this is similar to the Objective-C NSDictionary type, a HashMap in Java, or just Hash in Ruby/JS, but in Swift it’s very strict about the type. It takes a String as a key, and stores a UIImage as a value; no other types will be accepted. The reason we add the two parentheses is to call the constructor to init the empty dictionary. Just like how we use APIController(), we need to use [String : UIImage](). Hope that makes sense, if not yell at me on Twitter about it. Now, in our cellForRowAtIndexPath method, we want to do quite a few things, we basically want to access the images in our cache, or download them if they don’t exist while on a background thread. After a new image is downloaded, it should be stored in to the cache so we can access it the next time the image is needed, without needing to go start another download process. Let’s start by moving the imgData call out of our optional chain, and instead put it inside of the block that updates the cells. We’ll do this so that we can use image data from our cache *or* perform a new download, depending on the situation. Here, we’re switching to using NSURLConnection’s sendAsynchronousRequest method in order to download the image data on a background thread. Now our app should be less prone to crashing, and will now always have an image cell. If the image doesn’t exist (and initially it won’t) we need to download it. There are a couple of ways to initiate a download. Previously we used NSData’s dataWithContentsOfFile, but here we’re going to switch to NSURLConnection’s sendAsynchronousRequest, more similar to how our API works. The reason being is that we want to send off lots of small requests for images real quick, and we want to do it in the background. So let’s do that. Look at the line with a call to NSURLConnection’s static method sendAsynchronousRequest, which takes a function/closure as a parameter for completionHandler. The lines after this call represent a function that is executed only *after* the async request returns. Inside the block we will get back a few variables: response, data, and error. If an error exists, proceed to create a UIImage from the data using the UIImage(data: data) constructor. Next, we set the image cache to save our fancy new image with a key of the image URL. Using the URL as the key means we can find the image in our dictionary any time it pops up, even in a completely different context. You’ll notice we’re also using the cellForRowAtIndexPath() method here. The reason we use this is because sometime’s the cell that this code was running for may no longer be visible, and will have been re-used. So, to avoid setting an image on an unintended cell, we retrieve the cell from the tableView, based on the index path. If this comes back nil, then we know the cell is no longer visible and can skip the update. Okay! Give the project a run and see our amazing new blazingly fast, silky smooth table view! The complete code up to this point is available on Github as a branch ‘Part5‘. To get updates on this tutorial in your email, subscribe here. I’m also working on a book filled with practical tips and tutorials on working with Swift to develop iOS 8 apps. It’s now available for pre-order here. Part 6 will focus on adding a new View Controller that we can open up to, loading it with iTunes data. In parts 1, 2, and 3 we went over some basics of Swift, and set up a simple example project that creates a Table View and a puts some API results from iTunes inside of them. If you haven’t read that yet, check out Part 1, Part 2, and Part 3. If you enjoy these tutorials, I’m also working on a book full of quality content for Swift developers, and it’s available for Pre-Order now. Okay, so first there is one more thing we need to clean up. The Table View Cell thats being created in the delegate function cellForRowAtIndexPath is not the most efficient way to create cells. In iOS we always want to use dequeueReusableCellWithIdentifier in order to get a cell out of memory if one is available, rather than creating a new one every time a cell is rendered. This helps make scrolling fast, and keeps the memory usage down. First, we are going to be referring to this cell by a storyboard prototype, which in code is represented by a string. let kCellIdentifier: String = "SearchResultCell"
Next, we need to do some more storyboard modifications. In order for Swift to know what a SearchResultCell is, we need to specify the cell as a prototype cell in our storyboard, and set it’s reuse identifier to SearchResultCell. So open up your storyboard and select the tableview, change the number of ‘prototype cells’ to 1. Next, we need to click the newly added prototype cell to select it in the attributes editor panel. After you’ve selected it, in the attributes inspector change the Style to “Subtitle” and type in the identifier as “SearchResultCell”. What this is going to do is give us an already instantiated cell. Run the app, and once again we have the exact same result, except now we’re loading the cell from a storyboard prototype, which allows us to do all sorts of cool stuff with it. Making the cells do something! Whenever a cell is tapped, this function will run. So let’s grab out the iTunes data for the row that was clicked by accessing the index of the array set by indexPath.row, the integer id of the row clicked. And then let’s display the same info in a popup. Give it a run and you should now be able to see the name and price of any app clicked show up in a popup window. Cool right? The full code for Part 4 is available here. Part 5 focuses on speeding up our Table View. To get updates on this tutorial in your email, subscribe here.